We’ve talked about the importance of having ‘SMART’ goals for your marketing efforts, but after you create them then what? You expect that you will achieve said goals, right? This seems easier said than done, and it is definitely a process, however it doesn't have to be burdensome. There is a way to see to it that your goals are effectively met. It’s a little thing called strategy. What is strategy you ask? Easy. It’s a plan that you design to help reach your marketing goals. It is putting those plans into action that can get tricky. So how do you get to the desired destination and use your marketing strategy as a road map to reach your goal? 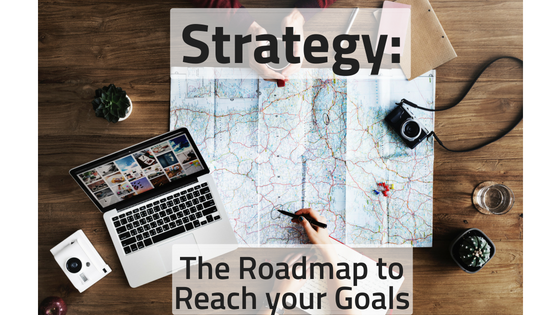 Here are three things to keep in mind when implementing a strategy and using it as a roadmap to reach your marketing goals. Relevance: To make sure your strategy will work you have to make sure it is relevant to the goal you are trying to achieve. Like the roadmap example, you wouldn’t get a map leading to Seattle if you needed to go to San Francisco. It would be counterproductive causing yourself to have to backtrack. Communicate: It is important to make sure that everyone involved with a particular goal fully understands the nature of the strategy. Each part must understand their role within the strategy so that it is properly implemented. Going back to the road trip example, if the passenger is doing the navigating, but doesn’t know how to properly communicate what is shown on the map then the driver will not know what direction to go or what exit to take. Just like with those within a business, if you have a strategy in place that you are unable to communicate, you will not reach your final destination. Being able to effectively communicate strategy is important if you want to reach your end marketing goals. Be Consistent: Consistent actions lead to results and the reaching of your goals. Remember consistency is key to ensure your actions are properly directed and that you get the results you desire. You have a plan, so actively and consistently perform the actions on that plan so that you reach your end goal. Again with the road trip example. If you don’t consistently stop to eat or fuel up then odds are you will become sluggish and your car may run out of gas and you could become stranded and unable to reach your destination. Much like strategy, if don’t actively use the strategic actions set in place to reach your goal then you will become stagnate in your implementation and your goal will not be reached. Don't forget, it is important to make a goal to make goals. It is a vital essential part to your overall marketing success. You then have to plan out and implement a strategy to reach them. For help with your marketing strategy, check out our other blog posts and free resources. You can also schedule your no-obligation, free consultation with our marketing experts to discuss solutions for you.